Why Our Hogs Love Our Hens! 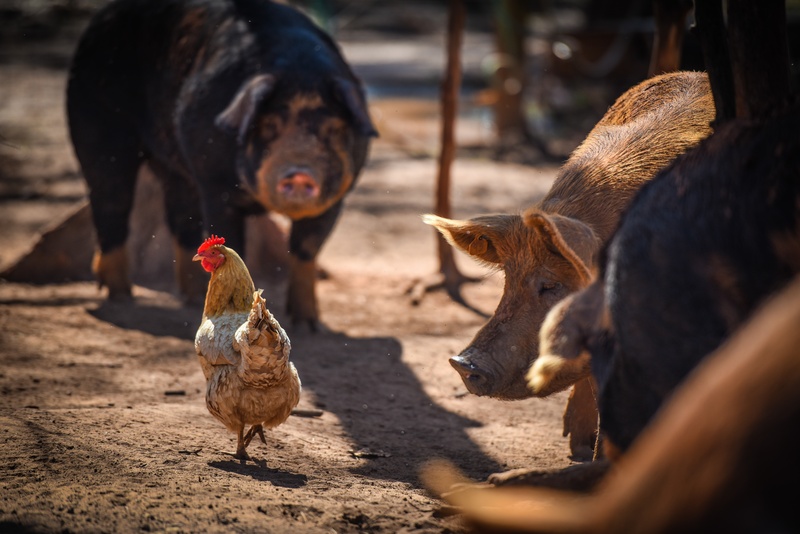 While eggs are available through our online store and Atlanta Whole Foods locations, the farm is also following our zero-waste doctrine and treating our pigs with healthy, pasture-raised, calcium-rich eggshells which are not perfect for sales. In order for our pasture-raised hens to express their natural instincts, roosters were reintroduced to our laying hen flocks. 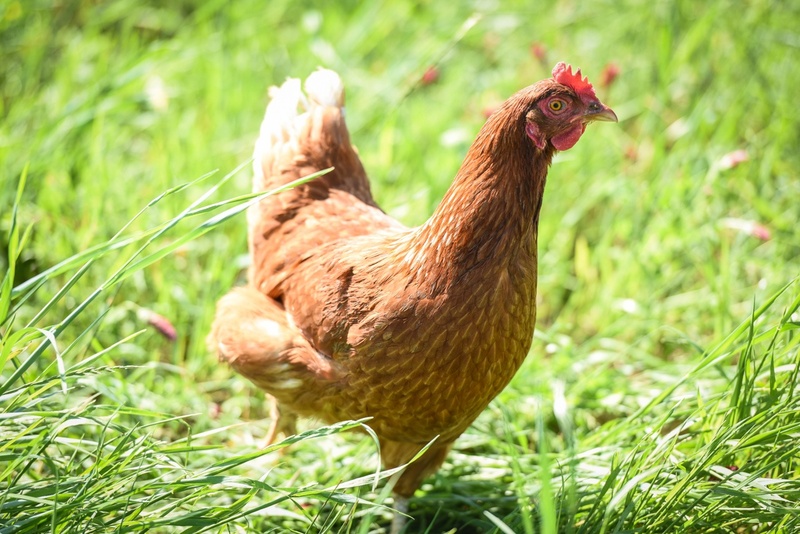 With roosters present, the hens begin laying at a younger age and grow larger combs, which possibly indicates the health and vigor of the hens. As a result of this reintroduction, a larger percentage of our eggs are fertilized but are a monetary loss because they can not be sold commercially. However, this does not render them useless on our farm. Studies on piglets confirm that the calcium in eggshells is absorbed as effectively as pure calcium carbonate. According to the International Journal of Food Sciences and Nutrition, the ingredient that makes eating eggshells beneficial is calcium, or more specifically, calcium carbonate. That is what 95 percent of the total makeup of eggshells consist of, which is similar to your own bones and teeth. 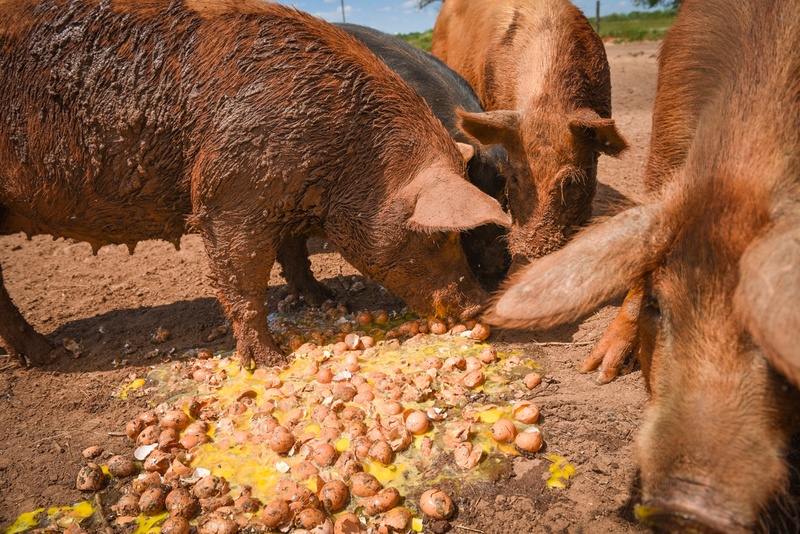 Eggs on our farm that have been fertilized or cracked are fed to our pigs as a delicacy. In the candling process, our staff might notice a small dark spot on the yolk, which would be an indication of fertilization. Once noticed, the eggs are immediately cracked in buckets and are later fed to our hogs. They absolutely love them, but eggshells are not for pigs alone. People are known to grind their own eggshells into a powder and add to juices or foods to increase their calcium intake. Dr. Mercola addresses the benefits of human consumption of egg shells. 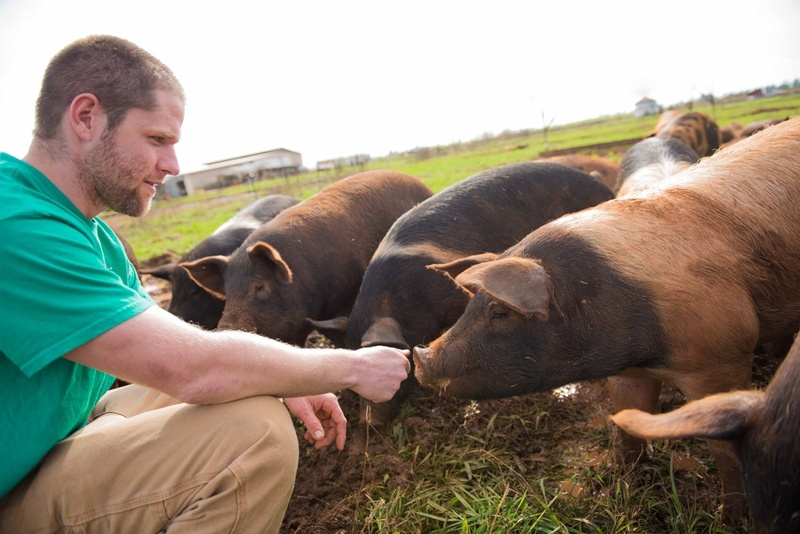 Our Hog Production Manager, Aaron Lorenz, pictured above, elaborates on our zero-waste hog feeding program: " Eggs are a great feed supplement for all hogs, but they're especially valuable for young pigs. We feed eggs to piglets as soon as they are weaned through their first few months of life. 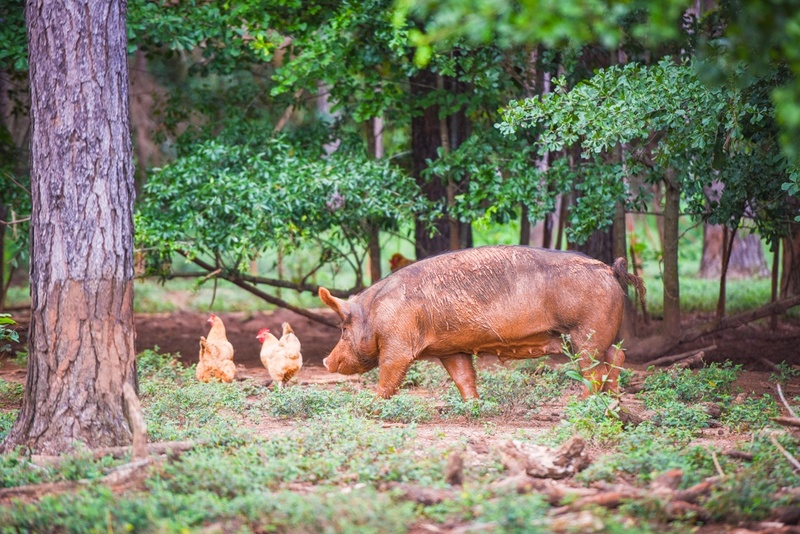 The complete proteins in pastured eggs boost our piglets immune system and growth rate and the pigs absolutely love them. 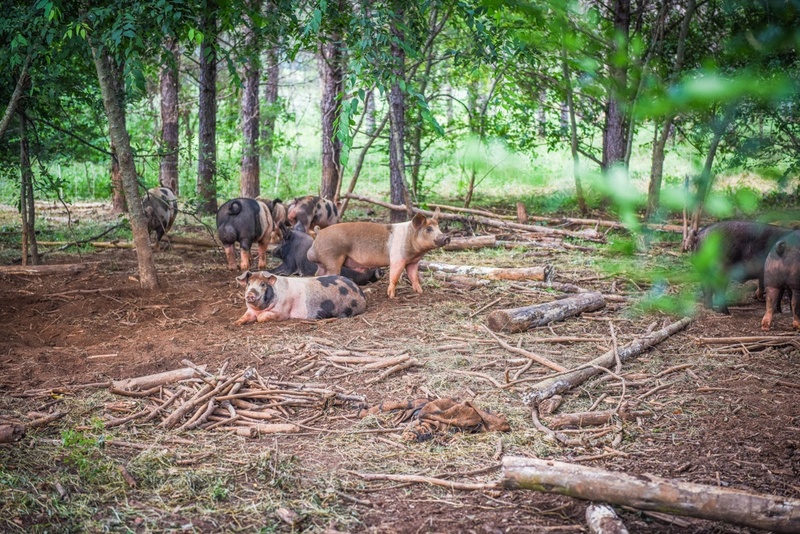 Animal protein is one of the toughest things for our pigs to find when they're foraging in the pasture. They get whatever insects and grubs they can, but pastured eggs are really the best protein source we can provide for them".